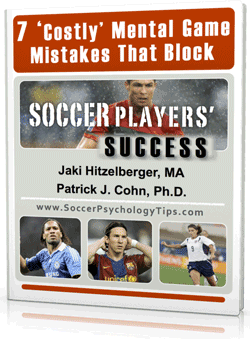 Injuries can create major psychological challenges for soccer players. Particularly when your trainer has given you the green light and you are ready to get back to playing. Even after a soccer player recovers fully from an injury, “mental scars” remain for some players. The biggest fear for athletes who return to their sport is the fear of re-injury. 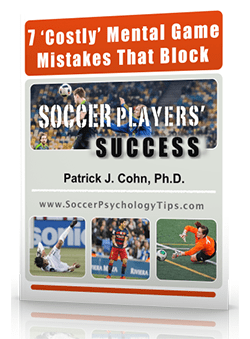 This fear can cause soccer players to play tentatively, safe, and shy away from hard challenges. We all know that trying to avoid injury actually increases the chance of getting hurt again. 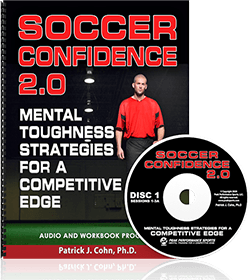 The more you worry and doubt your abilities when returning to soccer, the worse you will likely feel. The good news is you have control of what you focus on. The key is to reframe thoughts that are impacting your performance. Reframing is about challenging negative beliefs and changing the way we think about your injury. The goal is to think more rationally about your fears in order to reduce emotional impact and help you feel more confident. The goal is to feel confident when you return to competition. When we interviewed, Chip Vaughn, defensive back from the Indianapolis colts, he described how he has dealt with multiple injuries. He said that he tries to put any thoughts of his injury out of his mind. One way to cope with the fear of reinjury is that you focus on your strengths and capabilities rather than trying to AVOID reinjury. You do this by focusing more on what is important to your performance, such as putting pressure on the defense or possessing the ball. You also need to learn how to cut off any doubts before they sabotage your confidence. This requires being able to recognize when you are experiencing doubts and have a strategy to turn it around before the doubts undermine confidence. Before a game or practice, you might visualize (or feel) yourself playing effortlessly with no pain, just like you felt prior to your injury. If you play soccer, injuries can happen. Every athlete who gets injured needs time to heal and be 100% physically, particularly if you have been out for a while. It is important that you avoid expectations that you will return and be in the same shape you were preinjury right away. Be patient and tell yourself that you will return and play at the same level you did preinjury.